The National Route 66 and Transportation Museum in Elk City celebrates the Mother Road and America's love affair with the automobile. Leave the bustling sounds of the city behind and drive down a nostalgic stretch of highway lined with state-of-the-art museums, authentic diners and beautiful, windswept prairie lands. Check out our picks for the top things to do and see on Route 66 west of Weatherford and discover the unexpected attractions and charming towns that only the Mother Road can offer. 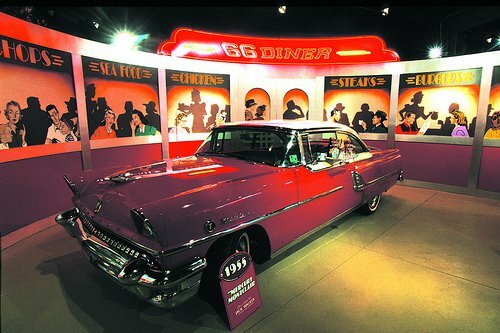 Immerse yourself in the history of America’s favorite highway as you wander through decade-themed rooms at the popular Oklahoma Route 66 Museum in Clinton. 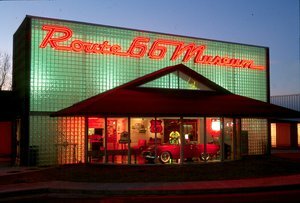 With a distinctly retro feel and six decades of Route 66 history on display, this museum is known as the “world’s largest curio cabinet.” Stroll down memory lane and get lost in each era’s music, style, automobiles and culture before heading back down the highway. 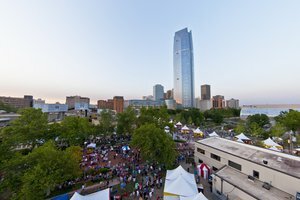 With more tribal headquarters than any other state, Oklahoma and American Indian culture go hand-in-hand. Dive headfirst into Oklahoma’s native heritage by visiting Mohawk Lodge Indian Store, conveniently located directly off the Mother Road. Plan to stop and pick out a souvenir or two - handmade goods like beaded moccasins are treasures you’ll keep for years to come. Also, don’t miss the nearby Cherokee Trading Post & Boot Outlet, where visitors can shop for Western items, as well as Oklahoma and Route 66 souvenirs. Important for its cultural, recreational and historical significance, the McLain Rogers Park & Historic Amphitheater in Clinton is a pleasant Route 66 stop. The art deco gates welcome visitors from the Mother Road and its 1950s-style neon lights still shine brightly at night. 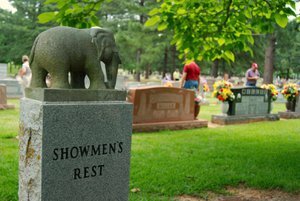 Take a break from driving and play putt-putt, have a picnic or attend the Clinton Route 66 Festival during a trip in May. It wouldn’t be a trip through Oklahoma on Route 66 without a pit stop for some of the state’s best barbecue. Jigg’s Smokehouse in Clinton has been stacking their flavor tall for over 30 years. 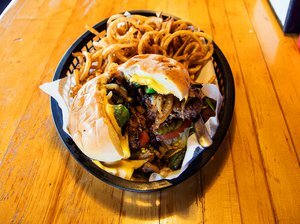 Their signature wooly burger is piled high with hickory-smoked ham, summer sausage, mayo, chow chow relish, cheddar cheese and their house barbecue sauce. Foss State Park is the perfect place to stretch your legs while taking a break from the Mother Road. This state park features a wealth of amenities including RV sites, tent camping sites, hiking trails, swimming areas, mountain biking trails and prime picnic spots. 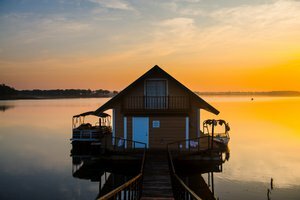 Relax and enjoy the beautiful scenery while watching the sun set over Foss Lake. Experience the charm of the Mother Road in its heyday at the National Route 66 & Transportation Museum in Elk City. Take a “ride” down Route 66 in a pink Cadillac and have fun at the mock drive-in watching classic movies like “Creature from the Black Lagoon” and “The Blob.” You can’t miss the museum’s neon Route 66 sign welcoming you from the highway. Also, don’t miss the adjacent Elk City Museum Complex, which is really several fun museums in one convenient location. Make it a destination along Route 66 and see replicas of an opera house, chapel, doctor’s office, rock schoolhouse, grist mill and a train depot. It covers history spanning from the territorial-era to the 1950s. The Elk City Museum Complex is also home to the Farm & Ranch Museum and Blacksmith Museum. Let the kids roam free at Ackley Park in Elk City and recharge after a long morning in the car under towering shade trees. This park has plenty to keep the whole family entertained including a playground, baseball fields, skate park, picnic areas, stocked fishing ponds, walking trails and more. Don’t miss the park’s crowning jewel: a full-size, all-wooden carousel featuring 36 hand-carved horses and two chariots. While admission to the park is free, there is a small charge for carousel rides. Famous for its appearance in the classic movie “The Grapes of Wrath,” which detailed the journey of Dust Bowl immigrants along Route 66, the Beckham County Courthouse in Sayre is a must-stop for any Route 66 aficionado. Constructed in 1911, the courthouse expertly blends neo-classical and Renaissance architectural styles, while also featuring a large clock dome. Get a photo in front of this famous landmark and immerse yourself in Oklahoma’s Dust Bowl and Route 66 heritage.